Contributed Photo – Scott Bradley, right, is shown on the podium after finishing 7th at the Ironman – Mont Tremblant. The other finishers, from left, are Monchy (Belgium) 6th; Jolicoeur Desroches (Canada) 4th; Sanders (Canada) 2nd; Beals (Canada) 1st; Russell (USA) 3rd and Long (USA) 5th. Missing from the photo is Carrillo (Mexico) 8th. 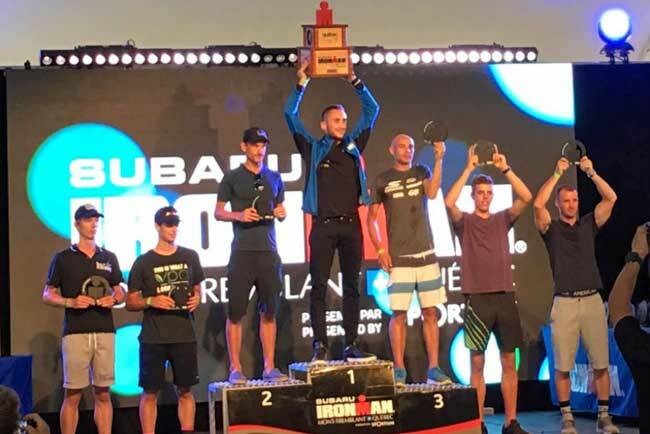 For his second consecutive Ironman race, Lyndonville native Scott Bradley earned a spot on the Male Pro Awards Podium at the recent Ironman-Mont Tremblant. This event included a full distance (140.6 mile) race. A full distance triathlon includes a 2.4 mile swim, a 112 mile bike ride and a 26.2 mile (full marathon) run. Bradley’s 7th place finish among the 20 Male Pro starters (the race paid the top 8 finishers) and 8th place overall finish out of 2464 starters were both personal bests in a full distance race. His previous bests were 11th and 15th respectively. Bradley signed with a new coach, who is located in Calgary, Alberta, on August 1st of last year. With the new training program/philosophy that this coach has put together for the 2018 season his results have shown significant growth/improvement. Bradley was 17th out of the 20 Male Pros coming out of the water in a time of 1:00:38. Then, riding the 7th fastest bike time of the day, he climbed to 6th among the Male Pros as he dismounted his bike, riding a 4:36:30 at an average speed of 24.30 mph over the 112 miles. This was a Personal Record (PR) for him. His run of 3:14:06 was also a PR., as was his total time for the day of 8:56:20. Ironman Mont-Tremblant was the final race of the year for professional triathletes to qualify for the Ironman World Championship in Kona, Hawaii, which will be held on October 13. This is the most prestigious triathlon race of the year. Points are earned by competing in Ironman 70.3 and 140.6 races around the world for a period of one year. The final 2018 Male Pro Rankings showed that 647 male professionals had raced in at least one race during the past year. Bradley’s final ranking was 185th, placing him in the top 29% of all male professionals from around the world. Fifty-eight (58) Male Pros have earned the right to race at Kona this year. Bradley is the Assistant Principal at Byron-Bergen Junior-Senior High School.